Note: I have added a schematic since originally posting. Also here is the data sheet for the chip and here is a link to an overview of the actual board that I am using. I am working on a project that uses an adafruit pro trinket 5v/16mhz to control a TMC2208 silent step stick in order to drive a small nema23 gear motor with a relatively light load. I know that the stepper driver is a bit underrated for a nema 23 but in this application, it should be fine. 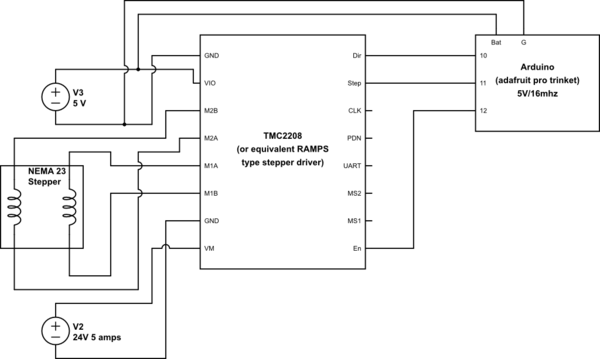 I have used setups like this before with no problems but I am finding that if the 24vdc that I am using to drive the stepper is connected to the VM/GND pins, the driver burns up immediately. This is with/without the the 5v logic power connected and with/without the stepper connected. I have burned through a number of these and I seem to have some sort of fundamental lack of understanding of some aspect of this setup although I have used setups like this without issue. In this case, I used a few different 24v power supplies which were all rated at 5amps, do I need to use a lower amp power supply? I have check the polarity and I have also checked to make sure that I am not sending 24v to the logic pins, just the motor power pins. I do not have the reputation to comment...so here goes. It looks like you do not have the ground for the motor supply and the ground for the logic supply connected together. Try that out! My guess is that there's a voltage spike at the point of initial turn-on. See https://www.pololu.com/docs/0J16/all for a technical description of this and some ways to mitigate it, but basically you want to put a couple caps (with very specific properties) between Vm and ground. As Chris Stratton kindly suggested, try swapping out another supply. Ideally, one with a current limiter to prevent more boards from letting the smoke out. Not the answer you're looking for? Browse other questions tagged stepper-motor or ask your own question.